One of the UK’s oldest Muslim communities is to launch an international intervention designed to provide comprehensive solutions towards achieving world peace in light of increasing global tension. The Ahmadiyya Muslim Community’s ‘Pathway to Peace’ campaign aims to present fundamental solutions to some of the biggest challenges currently facing the world, based on the teachings of Islam. The nine key points, labelled the ‘Principles of Peace’, will be announced at the annual Jalsa Salana in Hampshire on the 3rd, 4th and 5th August 2018. The convention is the UK’s largest Muslim conference of its kind and will attract over 30,000 people. Over 1800 people have already endorsed the campaign with the number expected to rise in the days of the convention. 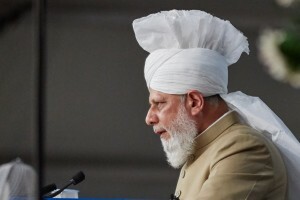 The Caliph of the Ahmadiyya Muslim Community, His Holiness, Hazrat Mirza Masroor Ahmad, has urged world leaders to take on board the principles in an effort to prevent an impending third world war. The call comes as issues as wide ranging as Brexit and the face off between global nuclear superpowers threatens to cause further devastation around the world.